Here is the full write up. In January 1905, the first REO automobile debuted at the New York Auto Show, and quickly established itself as the number-three seller behind Ford and Buick. 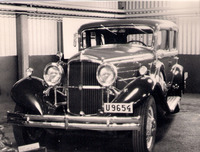 REO was dedicated to producing vehicles for the upper-middle price segment and were noted as being quiet and refined in various ways, and the public was impressed. In 1931, the REO Royale debuted with a 125 HP Straight-8 cylinder engine, a nine-bearing crankshaft and Lanchester vibration damper, one-shot lubrication, oversized hydraulic brakes providing uniform pressure on all wheels, and shutters that were thermostatically controlled. In the Spring of 1933, REO introduced the self-shifter for Royale and Flying Clouds, allowing drivers to keep both hands on the wheel and enjoy virtually effortless shifting. Designed by Amos Northup, the chief body designer for custom coach maker Murray, the Royale was not only an engineering marvel, but one wrapped in an elegant body. Launched during the Great Depression, REO sales were slow, but the Royale was particularly limited. The 1933 model year saw REO pricing between $2,445 and $2,995, expensive for many but still considerably less than other luxury brands of the era. This Royale Five-Passenger Sedan has enjoyed an extensive frame-off restoration with more than $160,000 invested. Finished in striking Black with Blue velour interior, no detail has been left unattended. The interior boasts a clock, and deep, lustrous wood appointments with resplendent stainless and chrome facets. REO Royale Eights such as this are recognized as Full Classic by the Classic Car Club of America (CCCA), marking them eligible for CARavan Tours or meets. I hadn't visited the forum in a while. Good to see more cars than then ones I was familiar with. The two restoration projects in the prior page were new for me, same as the white and silver model. Thanks for posting them! Today, August 15, 2015 is a banner day for everyone in the Reo Royale community. Today at the Mecum auction in Monterey, California, Lot S 58, a beautiful, but incorrect in many respects, 1933 Royale Sedan was sold for $100,000. If anybody had asked me yesterday what that car was worth, I would have said somewhere in the $40-50K range. The1933 and 1934 Royales have historically brought significantly less than their 1931 or 1932 counterparts. This particular car is stunning and beautiful, but as many of you have discussed in prior discussions, we think that many things are incorrect with this car, such as the velour upholstery, the dash, the wood grained header inside above the windshield, the carpeted floorboards in the front seat area, and other appointments. There is no doubt that there is heightened interest in the Royales in classic car circles and if the benchmark is $100,000 for a 1933 sedan, then what are the '31s and '32s worth especially the convertibles, coupes, and victorias? I think this is a recognition of the cost of restoration and the beauty and rarity of the Royale. They spent 160k on the car to get back 100k. I'm happy because it gives me hope I'm not a complete idiot. I like this picture as it shows a look of original details on the front of the car . The owner looks pretty proud of himself . Great pic, thansk for posting it! One interesting thing: the grill shutters are painted black (they appear darker than the car's color), as I have seen in a few cars... others with body color shutters, and a few with chrome shutters, this last case tends to be more common in today's restorations, but not so much on original cars. Yes, I noticed the black shutters too. This is what I am doing with my car. That is what I will do with mine too. It makes the grill collar (if I can call that way the moulding surrounding the grill) stand out, and the shape is gorgeous! one of the truly nicest grilles of the classic era, in my opinion. Good idea Victor. I was torn where to post it but I guess both places was the right answer. Great pic, A.J. Thanks for posting it. Yes, the headlights look a bit odd... if it is an original period pic from the era, could it be that only the lenses were changed to regular clear glass, just like in many original European lights of the era, particularly french? I don't know if there was a regulation at some countries, but I remember a lot of French cars with Marchal lights with clear glass. If it were a newer pic, from the 60's or so, I would have guessed the car had adapted sealed beams inside! Anyhow, no idea, but they do look odd. Nice car with the "trafficators" as I believe the call them in the UK, but which were common with European cars.